DWex, my forgotten watch, was not a successful project, probably because I rushed its design, I spent more money on it than I planned and I did not follow up with revisions. DWex was also not offered as a kit, but as an assembled board with SMD components, not easily hackable or expandable, pretty much a dead end from hardware perspective. Its idea is still sound though, after so many years: mostly sleep, to conserve battery, then, at a press of a button, flicker some LEDs to indicate the time. This rainy weekend I stumbled upon the few DWex boards I still have, and they brought back memories. One thought lead to another, and I found myself, characteristically (I am the "penny wise, pound foolish"- kind), soldering around once again. So here I am, writing another useless post, about another useless project, on how to convert time, money and energy into joy, sometimes mixed with frustration, when things don't work on the first try (as it's usually the case). DWex is equivalent to a (smaller) wsduino (ATmega328 + RTC), with 20 LEDs. Why not recycle it into something (physically) "bigger" by adding extras (alphanumeric display, micro switches, ESP8266, OLED)? But the most particular aspect of DWex is the way it shows the time on the analog round face, by blinking LEDs on request (button push). This is actually not suitable for continuous display, simply because it is confusing to make sense of non-stop blinking LEDs. add 3V3/500mA regulator to the board. This will be a work-in-progress for a while. While cleaning up my desk, I found a little I2C module that I completely forgot about. It is a breakout for BMP180 barometer sensor, which I probably bought on ebay for a couple of dollars (I just checked, it is still under $2). This tiny board can be added literally to any Arduino clock to display atmospheric pressure, with the help of Adafruit_BMP085 library. Connecting the barometer to Wise Clock 4 is trivial: I soldered wires directly to processor pins (SDA, SCL, VCC and GND), as shown in the photo. There is plenty of clearance between the board and the display. In the software, as mentioned, I used the Adafruit BMP085 library, which also covers the compatible BMP180. There is no extra setting required from the user: the pressure is displayed together with the temperature, and enabled/disabled from the TEMP+/- menus. Also, there is no extra settings when compiling/building: if the BMP180 module is not installed, no pressure data will be displayed. Another nice thing about BMP180 is that it can also provide the temperature. But, like DS3231, it seems to be a little off compared with a regular thermometer sitting nearby. Next, I will try to attached the little barometer to wsduino in an aesthetically pleasing manner, probably in the empty space in the top left corner. I saw Justin's recent post on Alpha Clock Five and I just couldn't resist not to try it myself too. Since I didn't have that clock, I thought of improvising one by making a 5-character display that would plug into my Wise Clock 4 board. 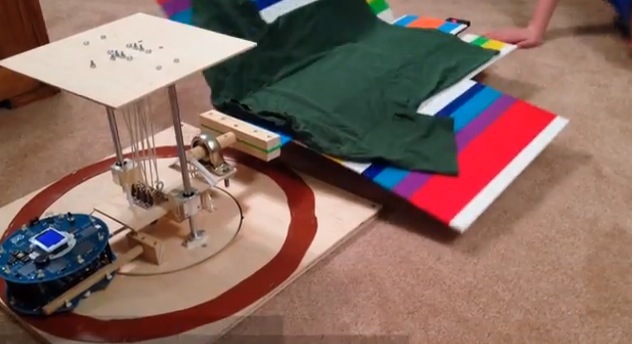 The idea was easy, the implementation not so. After many hours of hand-wiring, this is how it looks like. The displays are 1" single digit alphanumeric (common anode) from sparkfun, now retired. They came with non-functional dots, probably the reason they were less than $2 each. The spacing between the individual displays is forced by the protoboard. The 2 boards are connected through the pairs of 2x8 headers. All pins used by Alpha Clock 5 to drive the displays are wired to the unused header on the Wise Clock 4 board. The only regret is that this clock lacks seconds. One extra display would have added lots of extra value, but probably lacked the cool factor (the "6-letter clock" requires a lot more memory to store all 6-letter words than the approx 50k required by the 5-letter-word collection). My investigation into the failure of the M4 receiver remote controlling my Wise Clock 4 concluded with the need to add a step-up converter. The Sure 1632 display makes the input voltage drop sometimes below the absolute minimum of 4.5V required for the M4 module to work properly. It's not the noise (spikes) in the 5V power, nor the interference on 315MHz. I designed a simple "M4 receiver backpack" that uses a DC-DC step-up converter to ensure a 5V power for the M4 receiver module. The board supports 2 different kinds of converters, one from ebay (red in the photo below), the other from tindie (made by BBtech, black in the photo). 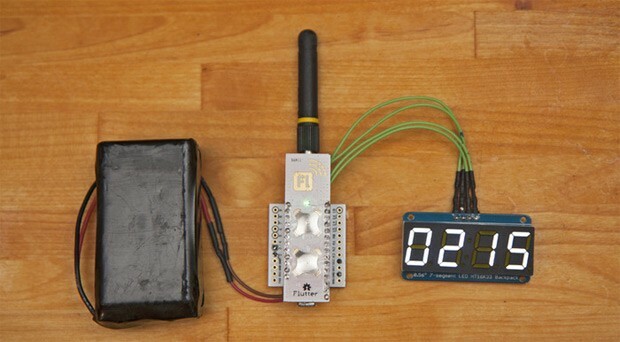 The wireless remote pair of 4-key fob transmitter and receiver module is sold by Adafruit or vendors on ebay. The assembled board wired to Wise Clock 4 is shown in the photos below. Note that only 3 out of 4 buttons on the remote have a function on the clock. Each button press could light up a (optional) LED on the receiver board for visual confirmation. A new design of the Wise Clock 4 board should probably feature a header for plugging in the receiver module, otherwise the back of the board will show a bunch of ugly wires. This M4 receiver backpack could be used for adding remote control to other devices with buttons, especially when these buttons are hard to access (due to enclosure design constraints), or hidden (for aesthetic purpose). One example that comes to mind is an oscilloscope clock fully enclosed in transparent acrylic; drilling holes for the buttons would require some design stretches. Last March RS Components, in collaboration with RobotChallenge, launched the Hack the Arduino Robot competition. If the words "ARM-powered wireless Arduino" send your heart aflutter, then you might be interested in... Flutter -- a development platform with the aforementioned qualities. The Kickstarter project claims the device has a usable range of over half a mile, letting you nail that wireless letterbox-checker project with ease. Similar tools, such as Xbee and Zigbee already exist, but the $20 price tag for the Flutter basic, and $30 for Flutter Pro (adds battery charging, another button, more memory) make this a tempting option for tinkerers on a budget. So, if building that mesh network of quadrocopters has been sitting at the top of your to-do list for too long, we recommend you get backing right now. There aren't many VFD clock kits out there that are software-compatible with Arduino (and by that I mean the "Arduino sketch" being compilable in Arduino IDE and uploadable through USB-FTDI). I settled for the VFD modular clock because the Akafugu people offered me the pair of PCBs in their kit (for a very reasonable $19, shipping included) and also because I already had most of the parts, including the two SMDs (that come pre-soldered in the kit: ATmega328 and HV5812) and the IV-17 VFD tubes. I built the clock following their great assembling instructions, but, as you will see, not without hitting a few stumbling blocks on the way. I should clarify that this post is not a review of the VFD modular clock kit (since I did not have the kit), but just a record of my observations. It was my choice to not use the kit, thus forcing myself to try to understand the schematic and the software. After I soldered all the parts on the base board, I realized the biggest problem of them all: some parts (sourced by me, and obviously of different size than those in the kit) stuck well above the two lateral headers, so the display shield (upper board) could not be plugged in the base board. Almost a showstopper at this point. The solution was to replace the tall 330uF/16V capacitor, bend both 47uF capacitors sideways, replace the 330uF/50V with a pair of thinner 100uF, push both inductors as much into the PCB as possible, then cut the top plastic wrapping on one of them. These, combined with the male headers not being flush to the display board when I soldered them, did the trick. I managed to have the clock looking as intended by its creators (if you don't look too closely), as shown in the next photo. The Akafugu designers tried to minimize the size of the clock, leaving little room for flexibility (that is, ability to use a broader range of components, of different sizes eventually). The sizes for the chosen components (especially the capacitors and the inductors) are really unique, any deviation would lead to the boards not fitting together. Using (smaller) SMD components would not be a good solution, since these would also need to be pre-soldered (or otherwise potential non-SMD-soldering clients would be excluded). The only compromise I can think of is enlarging the base board a little bit, keeping in mind that this 4-tube version is the smallest of the display boards, all others extending laterally beyond both sides of the base board. And finally, the last challenge: the software. I started from the original C code published here. This was written for the avr-gcc compiler and produces a hex file, which is then flashed onto the processor (no bootloader needed, nor provided) using an ISP programmer. I changed the code (available here), mostly cosmetically, to compile with Arduino 1.0. It does not require any other external libraries and it includes its own I2C/Wire functions (does not use Arduino's Wire library). In the end, I have an Arduino-compatible Akafugu VFD modular clock that looks just like the original one (I need to add the spacers though). 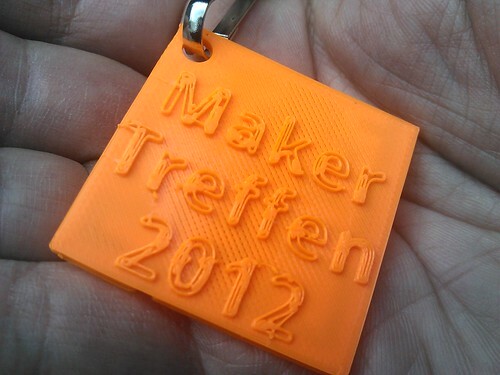 Hamburg Maker Meeting 2012, which took place last week and involved about 200 visitors and more than 20 exhibitors, has been a fantastic opportunity to meet and share experience regarding several topics, such as 3D printing, hacking, retro gaming and so on. At the Attraktor Makerspace, several projects have been presented and demonstrated by their inventors, among which we highlight a very nice Arduino-based floppy drive organ that has been employed to play the Tetris game theme. Moreover, among the others events planned for the meeting, a special sneak-preview session allowed all the interested people to get some insights on the new Arduino Due board, released a couple of days ago. A video of the event can be found here, while here you may find more pictures. More information can be found on the homepage of the meeting. 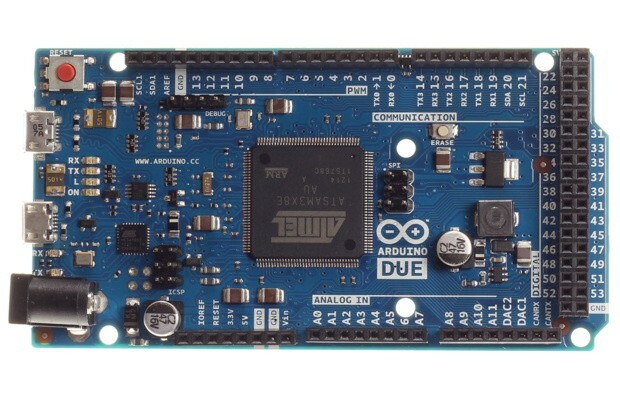 As much as we love the Arduino Uno, it's not the most powerful of hobbyist microcontrollers. Fortunately, the folks in Turin have just put the finishing touches on a 32-bit upgrade with buckets of potential. At the heart of the Arduino Due is an 84MHz Atmel CPU, based on ARM's Cortex M3 Architecture, which is capable of being the brains inside your own flying drone or homemade 3D printer. It should start trickling out onto shelves from today, setting you back $49, but hey, that's a small price to pay to automate your drinking adventures. Meet the Arduino Due, the 32-bit board that'll let your projects fly (really) originally appeared on Engadget on Mon, 22 Oct 2012 09:22:00 EST. Please see our terms for use of feeds.